Making fresh paneer at home is a great idea ! Boil 2 lts of milk in a thick bottomed pan, for around 15 to 20 minutes. Dilute the juice of one large lemon in 3-4 spoons water, and pour it on the boiled milk. The milk will immediately separate into water and fat. Keep stirring for around 5 more minutes. Now take a large bowl, and place a muslin cloth over the mouth of the bowl. Slowly pour the milk on the cloth, such that the water ultimately goes into the bowl through the cloth, and fat gets collected in the cloth. Now carefully wash the fat collected in the cloth with cold running water for around a minute, so as to cleanse the sour taste of lemon. After a while,when the fat cools down, carefully hold the ends of the cloth together, and make it into a bag; and then squeeze the excess water out of the fatty deposit. Take the fat in a plate, and shape it using a spatula. Now place a heavy object on it for around half an hour, to make the paneer firm and hard. 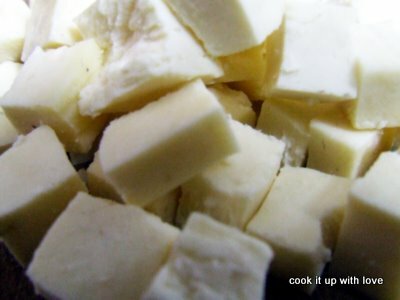 Paneer is ready, and now it can be either cubed for using it in gravies or pulav, or shredded or grated for using in parathas or burji.